Mix all the ingredients under the “Marinade” in a bowl to make a wet marinade. Mix the chopped mutton to the wet marinade. Pressure cook the marinated mutton till half cooked. Dry roast the ingredients under “garam masala” for anout 3-4 minutes. Let the dry roasted spices cool down to the room temperature. Grind the dry roasted spices to make the garam masala powder. Heat the oil in a heavy bottomed deep pan, on medium-low heat. Add in the onions and green chillies. Sauté till the onions turn transparent. Add in the half cooked mutton pieces. Cook on high heat for about 2-3 minutes. Add in the cumin powder, coriander powder and garam masala powder. Add in about a cup of water and season with salt. Bring to boil and simmer it for another 15 minutes. Add in the red sorrel leaves and mix well. Cover and cook till the mutton pieces have softened and the sorrel leaves have well blended with the curry base. Gongura mutton is ready to be served. 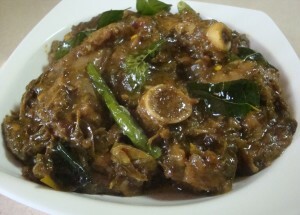 Serve hot gongura mutton with hot white rice.